Student of Stillness | Music | Style Weekly - Richmond, VA local news, arts, and events. Methodical and meditative, young jazz standout Victor X. Haskins never toots his own horn. The wisdom of age is widely praised, but there's also something to be said for the wisdom of youth. Case in point: the centered and disciplined 19-year-old trumpeter Victor X. Haskins. For a young artist on the rise, there's a remarkable stillness to Haskins. It's evident in the focused economy of his playing, perhaps even more so when he's simply standing, poised and listening, to someone else's solo. This focus has paid off. Haskins twice has been named by the Richmond Jazz Society as a Joe Kennedy Jr. Scholar. His performances in both jazz and classical categories have won multiple awards. 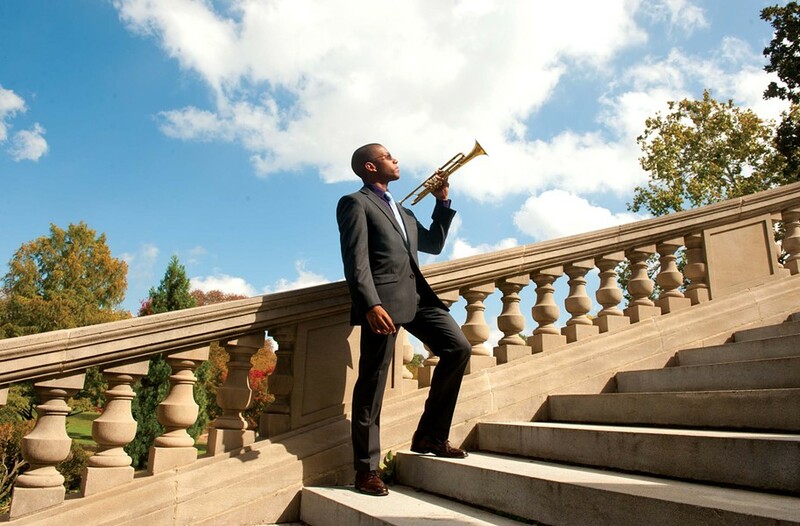 Perhaps most notably, he took second place in the 2012 National Trumpet Competition Jazz Division, where he competed with the country's best graduate and undergraduate players. Haskins' small ensembles include some of the best and most seasoned players in Richmond. His photograph, seriously natty in suit and tie, has become one of the iconic images in Virginia Commonwealth University's re-branding campaign. And his teachers are full of praise for his potential. "I met him when he was a freshman in high school," says international trumpet virtuoso and VCU professor Rex Richardson. "He was a good player for his age, but not particularly outstanding. The phenomenal thing about him is his understanding of himself. He's learned how he learns." Over lunch at Crossroads Coffee and Tea, Haskins agrees. "My whole premise, not just for music but for everything that I try to do in life, whether it is schoolwork or playing a video game, is to try to figure out the most basic thing that is happening," he says. "Try to break it down and find the root of what I am trying to accomplish." For example, he realized that the complexity of "playing the changes" — creating real-time improvisations over a shifting complexity of harmonies — doesn't require using each and every augmented and diminished chord. "It was mostly about ... playing melodies similar to the tune," Haskins says. "I am always following the phrasing, the feel of the tune, no matter how abstracted or inside it becomes. The music is never about what I want it to be; it is always about what the music wants to be." Giving it up for the music requires strategic restraint. Haskins says he knew he wanted to play jazz when he was in high school, but he put off confronting bebop's intricacies until he arrived at VCU, concentrating instead on mastering technique. He never practices "licks" — short melodic hooks — because he wants to avoid having his performances slip into cliché. In the end, his disciplined dedication to the scholastic mastery of fundamentals increases his freedom on the bandstand. Haskins' fluency has resulted in work with a multigenerational cross-section of leading musicians in the area, including saxophonist Skip Gailes, pianist Russell Wilson, trumpeter John D'earth, drummer Devonne Harris and bass player Andrew Randazzo. Perhaps his most adventurous work is in his vivid collaborations with pianist Steve Kessler. Playing with the brilliant, mercurial, ceaselessly inventive Kessler is regarded by many as a challenge; for Haskins it's a release. "Every time I play with Steve," he says, "I know we are always going for the most musical thing that we can do." Kessler has left Richmond for a gold-mining town in northern Ontario, where the Internet has made him a local hero. Haskins soon will be gone as well. He'll complete his degree at VCU in the spring, after his third year, and plans to move on to New York, Los Angeles or possibly Europe. "My goal is to play high-quality music for a living," he says. He's pursuing that goal with quiet, inexorable logic, a patient young man in a hurry. So enjoy him while he's here. When Haskins played a recent jam session at the Camel, celebrating the visit of young musicians from South Africa's University of KwaZulu Natal, he cut against the grain. Rather than following in the slipstream of a series of extroverted, up-tempo solos, Haskins played a slow, questing meditation on the melody. The Victor Haskins Group plays regularly at Bogart's in the Fan — next on Nov. 7 — and other Richmond venues. Haskins will perform as part of the 32 Bar Records Artist Showcase at the downtown Capital Ale House on Tuesday, Nov. 13, at 7 p.m. $15-$20. For a schedule of performances, go to victorhaskins.com.